This past Friday, Vicki and I made a quick trip to Amarillo. After we got there it was several quick stops in a row. Her last two stops were Kohl’s and Sam’s which took her a little longer. Before she went into Sam’s she told me to be watching for her and if it was raining I was to drive up under the awning and we would load up. Sure enough when she came out it was raining. I pulled up and we loaded everything then started home. As we sat at the stop light on Soncy it really began to rain. After the light turned green we moved toward I-40. The rain began to come down so hard and fast that it made it difficult to see. As I pulled onto I-40 there were trucks in front of me and behind me. They made it even more difficult to see. We made our way towards the east side of Amarillo and the rain lightened up. It rained off and on until we got to Pantex then it just stopped. We were hoping that the rain would continue to move towards Pampa. But it just didn’t happen on Friday. We drove on into Pampa without any sign of rain. Friday night we heard about the flooding that took place in parts of Amarillo. We thanked the Lord that we didn’t get caught in any of that. But we were still disappointed that it didn’t rain in Pampa. Saturday brought a refreshing rain to Pampa. It came really hard at first but then it just showered on us for a while. It was so refreshing to have the rain come. While we may not understand all the atmospheric conditions that bring about the rain, we know that God is the one that brings the rain. As I stood at the front door Saturday evening, I caught a glimpse of the rainbow in the eastern sky. It was complete from the north to the south. It was so beautiful! Once again I could see the hand of God as I looked at that rainbow. He had sent the rain and then placed the rainbow in the sky. 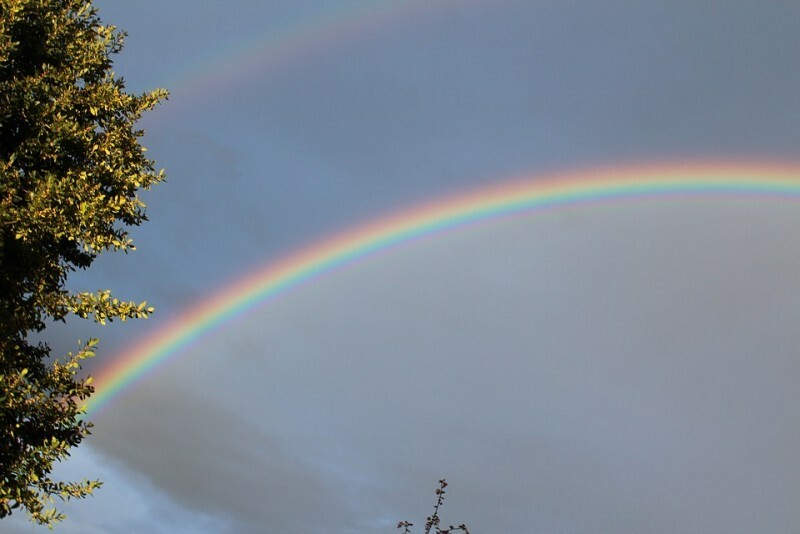 After the flood, God set a rainbow in the sky as a sign of the covenant (Gen. 9:12). As I looked at that rainbow, I was once again reminded of that covenant. I was once again reminded of God and His mercy. The rainbow Saturday evening was so beautiful, but the most beautiful part about it for me was the reminder of the promise of God. It was a sign of His covenant promise that ‘never again would the waters become a flood that would destroy all of life’. Gen. 9:15b. Then I saw it. It was another rainbow stretched beyond the first. I could see the southern part of it but it was not complete. Vicki thought I was a little kid as I kept looking to see what was going to happen next. The second rainbow never became complete but that didn’t change how I felt. As I look back on Saturday evening, I’m so excited that not only do I serve a God who makes promises, but places signs in the heavens as a reminder of those covenant promises. God is faithful and true. Sending rain on a dry thirsty land and then placing a rainbow in the sky is a God thing. I’m so thankful that we have a God that not only promises us His care, but places a sign of His covenant as a reminder of His promise.